This has been a massive year in the boxing world, with the sport becoming more popular than ever before. For a start, the monumental clash between Conor McGregor and Floyd Mayweather Jr was billed as “The Biggest Fight in Combat Sports History” and it didn’t let us down. While the first ever major battle between a top boxer and a celebrated UFC champion was something to truly savour, 2017 gave us far more thrilling moments in the ring than just that. Millions of people all over the planet have enjoyed the action from big championship bouts this year, while the return of Tyson Fury is among the mouth-watering clashes lined up for the next year or so. If you have been thinking about getting involved in this tough but hugely rewarding sport then there has never been a better time to do it. You will find it easy to get hold of the right gear, while locating a gym to get started with your new hobby shouldn’t be too difficult either. In this article we take a look at the gear you’ll need to get started as a boxer and then to progress if it turns out that you are good at it and enjoy it. To do this, we will look at some of the most popular products and brands on the market that you need to be aware of. Walking into the boxing ring with the wrong gear on might seem like a minor problem, but this is actually something that can be a massive issue when the time comes to get out there and fight. Using poor quality or unsuitable gear could make adversely affect your performance and might even cause you long term-health problems if it exposes your body to more punishment than you should be taking. On the other hand, high quality boxing gear can give you the slight edge that you need to be at your best. Even a slight advantage can turn out to be crucial once the fight starts. Then there is the psychological effect of using good or bad gear. Will you move into the ring feeling on top of the world or feeling as though you are embarrassed about being kitted out like a third class fighter? Buying your boxing gear should be good fun as well as practical. There are certain pieces of equipment that every boxer uses and that you need to purchase at some point, both for training purposes and for fighting. This sport doesn’t require a huge amount of equipment and it isn’t especially expensive, so it makes sense to focus on getting good quality gear that is going to be give you a high level of performance and also last for a long time. Top name brands in this industry include the likes of Everlast, Winning, Rival, Title and Fairtex. However, there are many more brands that you might come across and be interested in trying. You should start off by looking at the types of boxing gloves that you need. If you are going to take this sport seriously then you will need at least 2 different types of gloves, and possibly more. You can’t afford to use the wrong type of gloves for training or for fights, so it is crucial that you are well prepared in this respect. Once you know what type of gloves you need, the next step is to choose the correct size and weight. You will need to choose your gloves taking your weight, height and hand circumference into account. Pro fight gloves. Built to hurt opponents. Amateur fight gloves. Bigger than pro gloves to prevent too much damage being done. Every boxer needs to use a hand wrap during fights, to protect his own hands and also to avoid inflicting serious damage on his opponent. This is a simple yet essential step that you can’t afford to miss out. The mis-use of hand wraps has led to at least two of the most famous cheating incidents in boxing history. Yet, if you do it right and make a smart choice it will help you to keep your hands and wrists in good shape while boxing, lessening the impact of poorly placed punches and helping you to avoid long-term damage. Each boxer will use a different length of hand wrap, as it depends upon factors such as their hand size, the rules they are fighting under and the type of gloves they are wearing. Fingerless gloves filled with gel are easier to use but don’t fit as tightly. Jump ropes are a crucial piece of kit for any boxer. This is something that is an essential part of any boxing training regime and is necessary to get you into great shape for your fights. Jumping the rope is going to give you the speed, co-ordination and balance that you need in the ring, so you shouldn’t underestimate the value of a good jump rope. The following are some of the key points to take into account. Since good footwork is such a big part of boxing, choosing the right shoes is something that you will want to put some effort into. You certainly can’t afford to make the wrong choice and get boxing shoes that are uncomfortable, have poor grip or don’t let you move around the ring easily. The most obvious difference between different boxing shoes is that some are high-top and others are low-top. Yet, this isn’t the only decision that you have to make. Low-top shoes tend to let you move around more quickly but don’t offer as much ankle support as high-top shoes. Try them on for comfort. You will want them to feel light and manouverable with a good grip too. The tremendous value of a regular punch bag workout means that it is one of the pieces of boxing equipment that you simply can’t do without. You might be surprised to see the variety you can choose from, with the possibility that you will choose to use more than one bag at different times. It is by using this punch bag regularly that you will improve your punching power and speed, so you will want to choose the right type to suit your current needs and improve your technique. The right size depends upon your height and the kind of workout you want. Some people go for a 4 foot bag, although 5 foot models are more popular. There are also 6 foot punch bags that you might like to try, as they offer you more target areas to hit. A light punch bag is ideal for working on your punching speed and accuracy. They tend to start at 25 pounds. The better physical condition you in the heavier the bags you can choose from. Heavy bags are for resistance work and for practicing your big punches. Really big hitters can use bags of up to 100 pounds but most boxers will look at one weighing maybe 60 or 70 pounds. The movement of your heavy punch bag should be minimal, with just some swaying. Lighter bags move more, meaning that you need to focus more on landing punches precisely. These well-designed Everlast Pro Style Training Gloves have been created with the idea of helping you to train like a pro in order to be able to fight like one. For example they come with full padding on the front and back of the wrist to help you improve your technique. Another nice feature is the ThumbLok that makes sure that your thumb and fist are both in the right position to avoid injury. The gloves follow the shape of your fist to make it easier and more natural to use a solid punching technique all the time. There are different colours and sizes available in these gloves. In terms of size, you can choose from 12, 14 and 16 ounce sizes depending upon your height and size. You can also choose from a traditional style of lace up fitting or the quick and easy option of the hook and loop style of wrist strap. 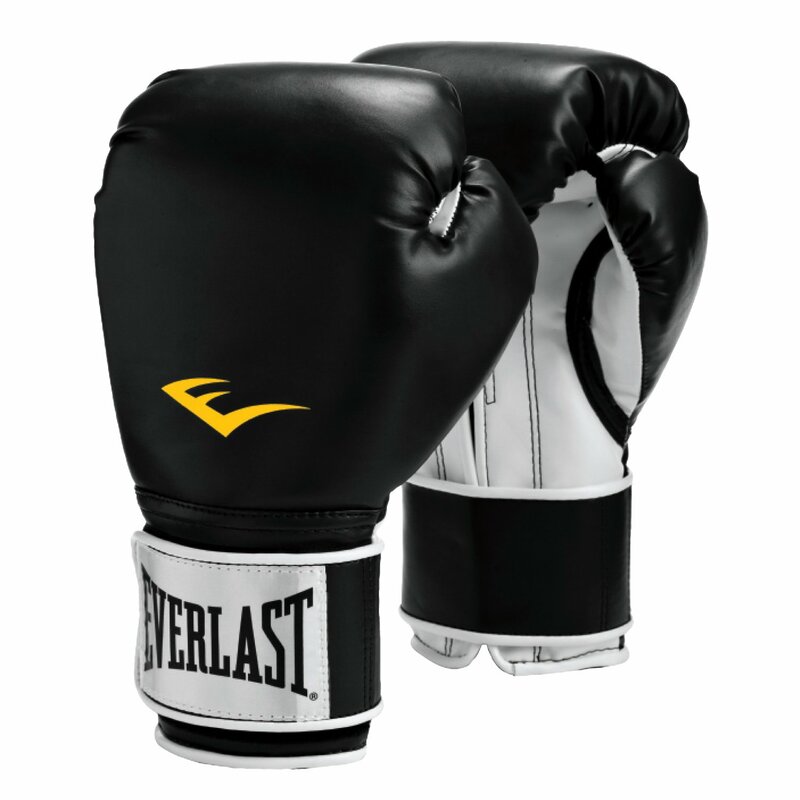 These Everlast training gloves come with a 120 day guarantee, so it pays to check them out fully before using them for the first time. Hand wraps aren’t the most exciting pieces of boxing gear but they are essential in order to fight and train safely. 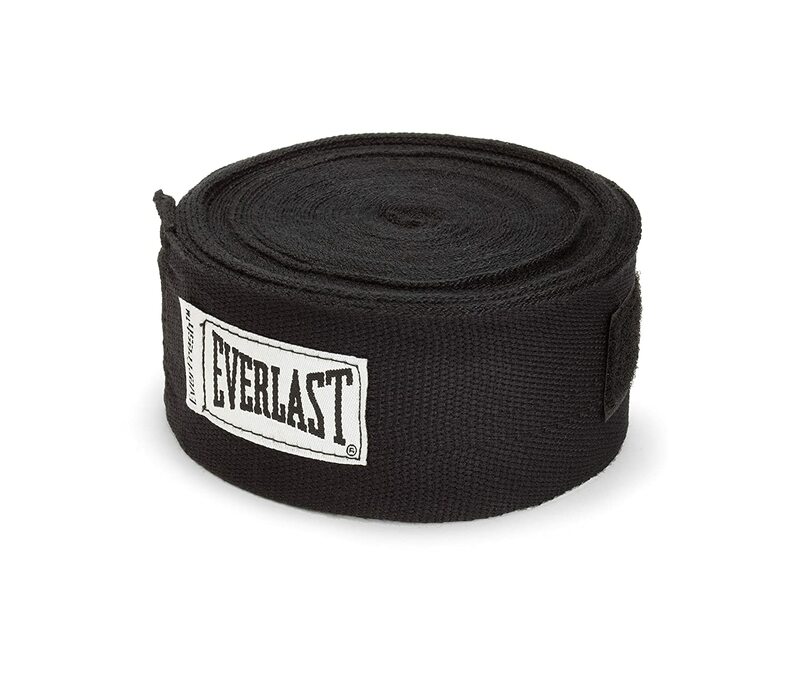 These Everlast Professional Hand Wraps are a solid option that won’t let you down. What you get is 180 inches of material. The material used is a nylon/polyester blend that is highly breathable and also suitable for machine washing. In addition, the anti-microbial treatment used keeps the wraps free of bacteria and bad smells. A hook and loop closure makes it easy to fit them snugly and securely. You can choose from a range of colours in order to get the style that most suits you. Naturally, you get 2 wraps with this item. The presence of a 120 day quality guarantee also means that you can buy them with confidence. Given the importance of jump rope training to boxers, this is a purchase that you will want to get just right. This jump rope is a good choice for either a safe and effective warm up or else a full training session. A big benefit with this rope is that the length can be adjusted very easily. This means that it can be used by different people and it also means that you can make it shorter as you progress in order to focus on improving your speed. 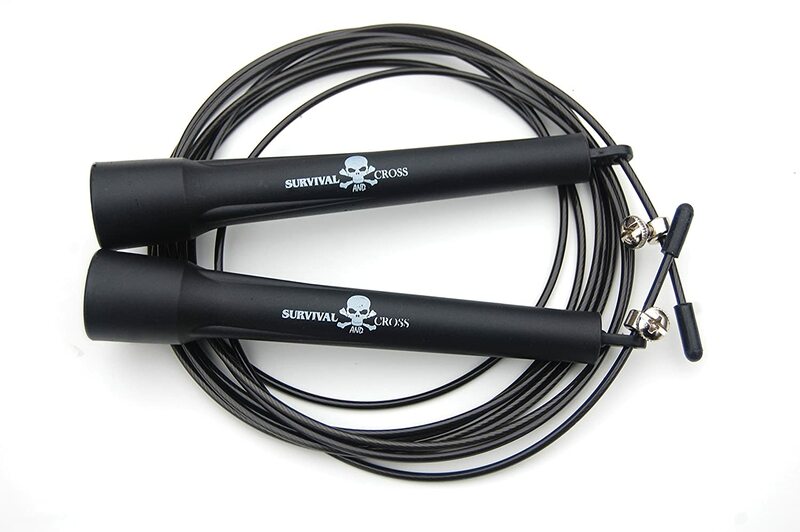 The Survival and Cross Jump Rope is also extremely lightweight and won’t get tangled up, which allows you to work out with confidence even when you start building up your speed. The fact that it is so small and portable allows you to travel anywhere with it. You can download an instruction manual once you purchase this item, so you can use it with a tremendous amount of versatility and flexibility. These lightweight boxing shoes give you the mobility and lightness that you need to dance around the ring freely or to train effectively. 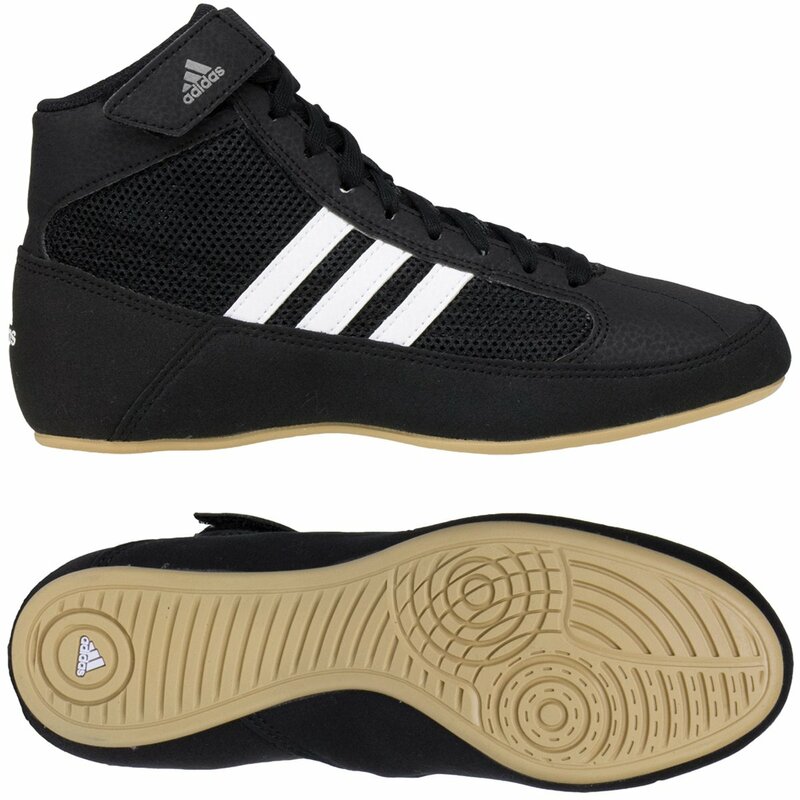 The Adidas HVC2 Speed Shoe is built out of synthetic suede and synthetic leather with a rubber sole. Nice touches include the elasticised lace straps that help to ensure that your laces are as secure as possible. You also get a layer of mesh that lets your feet breathe comfortably even in intense moments of fighting or training. These Adidas boxing shoes offer a narrow, tight fit that feels reassuring and are highly durable despite being so light. 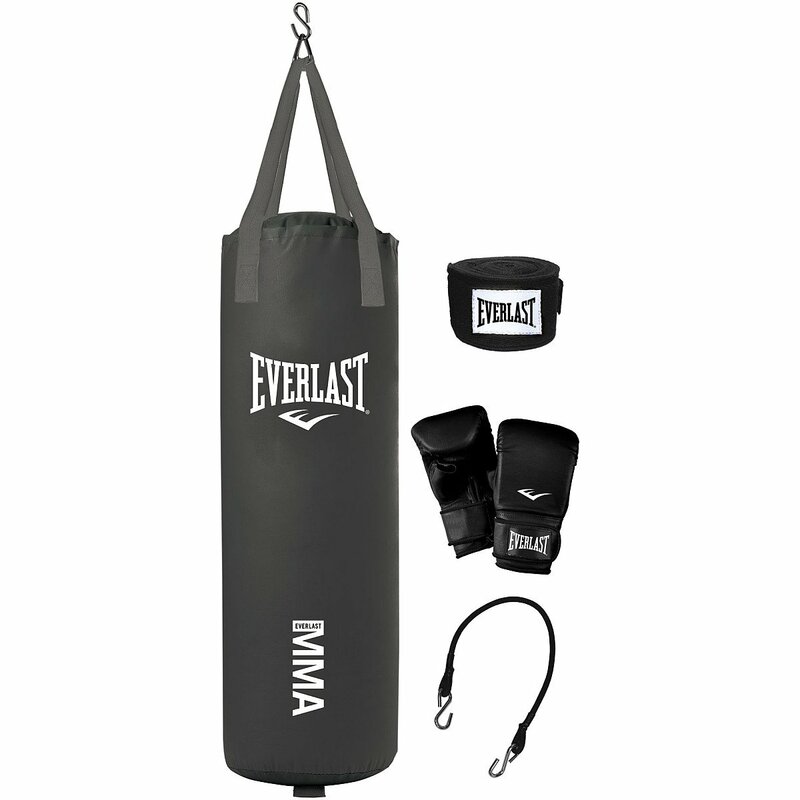 The Everlast 70-Pound MMA Heavy-Bag Kit is a great piece of kit for helping you to build up your strength and resistance while honing your punching technique safely. This is a fairly complete kit that comes with a 70 pound heavy bag, suitable gloves for using with it and a set of 108 inch hand wraps. Therefore, if you are just getting started on this sport then you will find everything that you need to get off to a strong start with no fuss. The bag includes a bungee cord for extra resistance and it has a height customisation chain that you can adjust to suit your needs. If you are wondering what this bag is filled with then it is a mixture of natural and synthetic fibres that are added to sifted sand to get the right weight and consistency. These pieces of gear on their own won’t make you into a top class boxer. However, they will give you a powerful starting point for building up your boxing skills safely and sensibly. If you are planning to start boxing then all of these are essential purchases that should give you years of use out of them. By choosing wisely and getting high quality, durable gear you will feel ready to take on the world before too long. Don’t make boxing training and fighting any more difficult than it has to be. By getting the right gear at the very start you will be able perform to the best of your ability with a lot of confidence.